Fiat 500 takes to the skies over London | What Car? 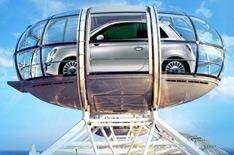 Fiat is celebrating the on-sale date of the Fiat 500 in the UK with a trip in the London Eye. The supermini will take a turn in one of the London Eyes pods at 8pm on January 21 - thats exactly 500 hours into 2008 and also the day the car officially goes on sale. Dont expect to be at the front of the queue if you go into a Fiat showroom on January 21, though. Fiat already has 2700 customers waiting, so order now and you can expect delivery in March. Discounts will also be hard to come by on such an in-demand car. Even new car brokers, usually a reliable source of good deals, are struggling to offer a saving. Drivethedeal.com will sell a 1.4 Sport 3dr for 10,700, for example, exactly the same price a Fiat dealer would charge. List prices start from 7900 and rise to 10,700.